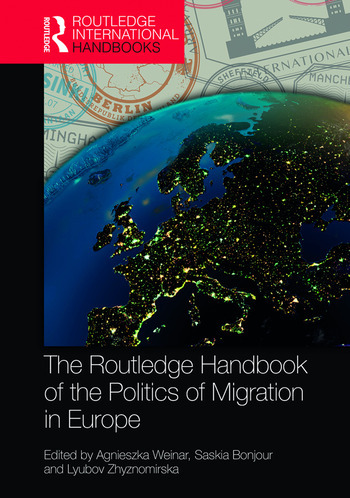 The Routledge Handbook of the Politics of Migration in Europe provides a rigorous and critical examination of what is exceptional about the European politics of migration and the study of it. Crucially, this book goes beyond the study of the politics of migration in the handful of Western European countries to showcase a European approach to the study of migration politics, inclusive of tendencies in all geographical parts of Europe (including Eastern Europe, the Western Balkans, Turkey) and of influences of the European Union (EU) on countries in Europe and beyond. Each expert chapter reviews the state of the art field of studies on a given topic or question in Europe as a continent while highlighting any dimensions in scholarly debates that are uniquely European. Thematically organised, it permits analytically fruitful comparisons across various geographical entities within Europe and broadens the focus on European immigration politics and policies beyond the traditional limitations of Western European, immigrant-receiving societies. The Routledge Handbook of the Politics of Migration in Europe will be essential reading and an authoritative reference for scholars, students, researchers and practitioners involved in, and actively concerned about, research on migration, and European and EU Politics. Agnieszka Weinar is an Adjunct Research Professor at the Institute of European Union and Russian Studies at Carleton University, Ottawa, Canada. Saskia Bonjour is Assistant Professor in Political Science at the University of Amsterdam, the Netherlands. Her research focuses on the politics of migration and citizenship in the Netherlands and in Europe. Lyubov Zhyznomirska is an Assistant Professor in the Department of Political Science at Saint Mary’s University, Canada. She works at the intersection of migration studies in Europe, the politics of post-Soviet countries, and European Union politics.